Is Order Management a Provisioning System or Your Best Salesperson? You see, telecom-industry terms are defined slightly different in each person’s head. And those definitions are colored by the person’s unique background and how or when the person originally learned the terms. And it’s often hard to change peoples’ notions of these industry terms once they’ve gone through the trouble of learning it. Truth is, the commonly accepted meaning of telecom terms evolves over time. The term “switch,“ for instance, used to mean a Class 5 circuit switch. But today people widely use the term “switch” when taking about a softswitch, though that’s an entirely different animal than a Lucent 5ESS. “Billing“ is another term that’s gone through a meaning makeover. Billing used to be considered merely an accounting term — the rating of calls and mailing of paper bills. But as we know, today billing also refers to electronic billing, online charging, and even sending real-time marketing offers to subscribers. So terminology is a big hurdle to overcome. And I see that every day I try to persuade people to expand their definitions of “order management.“ At the recent B/OSS Live! conference, I posed the following question to my audience: Why don‘t CSPs think about using order management as a tool to differentiate their offerings? I’ve found that “order management as differentiator“ is a totally new concept for many CSP people. In fact, many see order management in one dimension only — a step in the provisioning process: Take service order from Customer A and provision it in Network B. But to me, the concept of order management as differentiator is very real because I’ve seen how our CSP clients and those in other industries are leveraging a modern order management system to boost sales and become more efficient. Store Pickup: Buy online, skip the shipping charge and pick up an order in as little as 45 minutes after placing it. Ship-To-Store: Out-of-stock products that are available online can be shipped to any Best Buy store for customer pickup, without shipping fees. Friends & Family Pickup: Place an order online and have someone else pick it up, avoiding an inconvenient trip to the store or giving an out-of-town relative immediate access to a purchase. Warehouse Pickup: Avoid delivery charges and scheduling conflicts by picking up products directly from a local Best Buy warehouse. Email Notification: Customers are notified via email when their product is ready for pickup across each of the shipping/pick up methods just described. Without an efficient order management system in the background, all of these new Best Buy capabilities would be not be possible. And why does Best Buy offer these new shipping options in the first place? Because in an age where customers are empowered by Web searches, social networking sites, and anytime/anywhere communications, Best Buy figures a better customer ordering experience is a differentiator. And when executed well, an advanced order management system is easily the best salesperson a company can ever have. 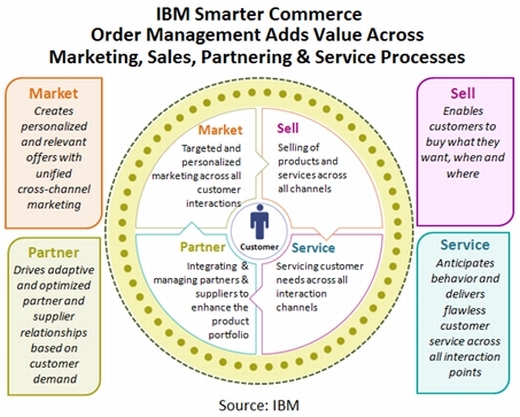 To better explain my point, IBM put together the chart below which showing how order management has expanded beyond the one dimension of provisioning a service order. Today we believe order management systems can help service providers deliver improved commerce processes: helping CSPs better market, sell, service, and partner. Now the corner of the telecom market you come from will determine how important each of these four dimensions will be to your company. However, several North American operators who sell wireless and IPTV services have already put some of these advanced practices and systems in place. 1. Service Cross-selling — Do you currently sell your services across web, call center, store and mobile phone channels? 2. Consistency — When a customer starts an order online, can he continue the order seamlessly in the call center or vice versa? Do we provide consistent brand and information presentation across all channels? 3. Conversation History — Is the history of sales conversations centralized so we have “in-progress“ intelligence on the status of orders? 4. Inventory — Do we have accurate views of inventory across sales channels? 5. Supplier Collaboration — Are our interactions with suppliers optimized to ensure just-in-time delivery of partner components that support our services? 6. Partner Integration — Do we enable Amazon.com-style partnering, by providing essential services such as online storefront, payment collection, notification to ship product, and final settlement between the customer and partner? 7. Provisioning Integration — Is our interface sophisticated enough to drive fully mechanized orders and change orders to the backend network? 8. Fulfill Anywhere — Do we support fulfillment across channels (e.g., buy on-line, pick-up in store)? So what percent of questions did you answer “Yes“ to? If it’s 100 percent, congratulations, you no longer need to read my blog. If it’s less than 100 percent, though, you now have a sense of the challenges ahead. Like the chicken or egg story, you may never know which comes first — customers demanding a better ordering experience. . . or a competitor forcing the issue by stealing some market share. Either way, recognizing that order management has changed with the times is the first step to getting the job done. John Konczal leads IBM’s worldwide industry marketing, market planning, and sales enablement efforts for the company’s B2B and commerce solutions ( Sterling Commerce , WebSphere Commerce, and ILOG Optimization brands) in the communications and media sectors. His focus is on positioning e-commerce, order-management applications and B2B integration solutions to drive new revenue streams.